The hearing will debate the state of play of “criminalisation” in the world and how it is addressed at national and international level. 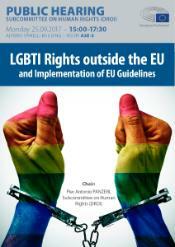 It will also focus on the implementation of the EU Guidelines on LGBTI rights (2013). The hearing gathers together experts and activists from Europe and its eastern and southern neighbourhood. Unfortunately, more than 75 countries worldwide still criminalise homosexuality with at least five using death penalty. The European Parliament remains committed to equality of treatment including for LGBTI individuals and is actively encouraging states to repeal discriminatory legislation and adopt practices that respects individual Human Rights.